The Modular Earth Submodel System (MESSy) is a multi-institutional project providing a strategy and the software for developing Earth System Models (ESMs) with highly flexible complexity. The strategy follows a bottom-up approach, meaning that the various processes and diagnostic tools are implemented as so-called submodels, which are technically independent of each other and strictly separated from the underlying technical model infrastructure, such as memory management, input/output, flow-control, etc. The MESSy software provides generalized interfaces for the standardized control and interconnection (coupling) of these submodels. The present time-unlimited Special Issue hosts scientific and technical documentation and evaluation manuscripts concerned with the Modular Earth Submodel System and the models build upon it. Moreover, it comprises manuscripts about scientific applications involving these models. This study investigates if ozone source apportionment results using a tagged tracer approach depend on the resolutions of the applied model and/or emission inventory. For this we apply a global to regional atmospheric chemistry model, which allows to compare the results on the global and regional scale. Our results show that differences on the continental scale (e.g. Europe) are rather small (10 %), on the regional scale, however, differences of up to 30 % were found. This work presents a submodel description for the atmospheric cycling and air-surface exchange processes of semivolatile organic compounds. The submodel is meant to be applied within a global atmospheric chemistry-climate model. The simulation results for polycyclic aromatic hydrocarbons confirm progress in modelling semivolatile species, verified by comparison with surface monitoring data. The significance of new modelling features for tracer distributions was quantified in a sensitivity study. We have extended ATTILA (Atmospheric Tracer Transport in a LAgrangian model), a Lagrangian tracer transport scheme, which is on-line coupled to the global ECHAM/MESSy Atmospheric Chemistry (EMAC) Climate model, with a combination of newly developed and modified physical routines, and new diagnostic and infrastructure submodels. The results show an improvement of the tracer transport into and within the stratosphere due to the newly implemented diabatic vertical velocity. The atmospheric concentrations of the anthropogenic greenhouse gas methane are predicted to rise in the future. 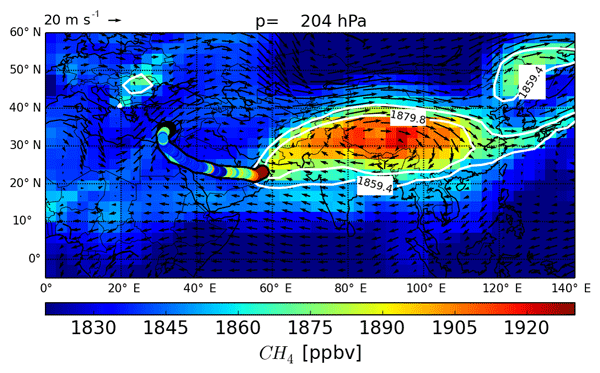 In this paper we investigate how very strong methane concentrations will impact the atmosphere. We analyse two experiments, one with doubled and one with quintupled methane concentrations and focus on the rapid atmospheric changes before the ocean adjusts to the induced forcing. These are in particular changes in temperature, ozone, the hydroxyl radical and stratospheric water vapour. Use of multi-instrument satellite data is important to get consistent simulations of aerosol radiative forcing by a complex chemistry climate model, here with a main focus on the lower stratosphere. The satellite data at different wavelengths together with the patterns in the simulated size distribution point to a significant contribution from moist mineral dust lifted to the tropopause region by the Asian summer monsoon. It is frequently assumed that one methane molecule produces two water molecules. Applying various modeling concepts, we find that the yield of water from methane is vertically not constantly 2. 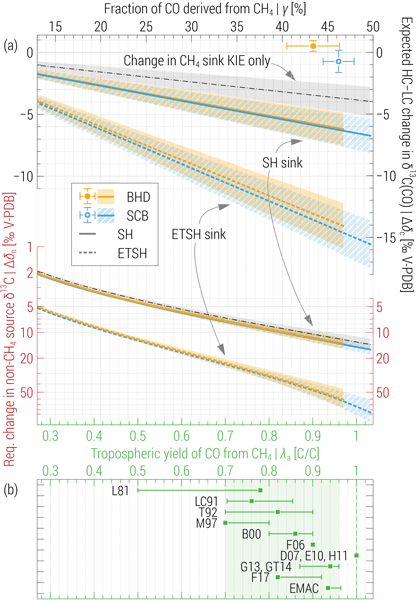 In the upper stratosphere and lower mesosphere, transport of intermediate H2 molecules even led to a yield greater than 2. We conclude that for a realistic chemical source of stratospheric water vapor, one must also take other sources (H2), intermediates and the chemical removal of water into account. 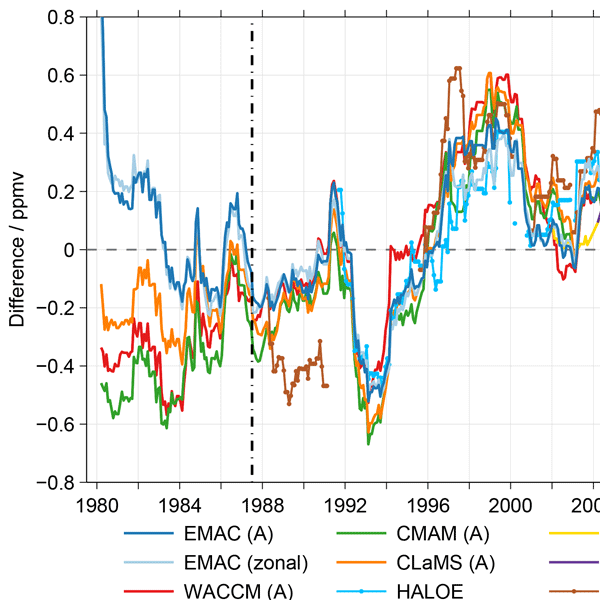 Using the observational data on 13C (CO) and 13C (CH4) from the extra-tropical Southern Hemisphere (ETSH) and EMAC model we (1) provide an independent, observation-based evaluation of Cl atom concentration variations in the ETSH throughout 1994–2000, (2) show that the role of tropospheric Cl as a sink of CH4 is seriously overestimated in the literature, (3) demonstrate that the 13C/12C ratio of CO is a sensitive indicator for the isotopic composition of reacted CH4 and therefore for its sources. We have integrated the LPJ-GUESS dynamic global vegetation model into the EMAC atmospheric chemistry-enabled GCM (general circulation model). This combined framework will enable the investigation of many land-atmosphere interactions and feedbacks with state-of-the-art simulation models. Initial results show that using the climate produced by EMAC together with LPJ-GUESS produces an acceptable representation of the global vegetation. Trend estimates of lower stratospheric H2O derived from the FPH observations at Boulder and a merged zonal mean satellite data set clearly differ for the time period from the late 1980s to 2010. We investigate if a sampling bias between Boulder and the zonal mean around the Boulder latitude can explain these trend discrepancies. Typically they are small and not sufficient to explain the trend discrepancies in the observational database. To reduce the climate impact of human activities, it is crucial to attribute changes in atmospheric gases to anthropogenic emissions. We present an advanced method to determine the contribution of emissions to OH and HO2 concentrations. Compared to the former version, it contains the main reactions of the OH and HO2 chemistry in the troposphere and stratosphere, introduces the tagging of the H radical and closes the budget of the sum of all contributions and the total concentration. 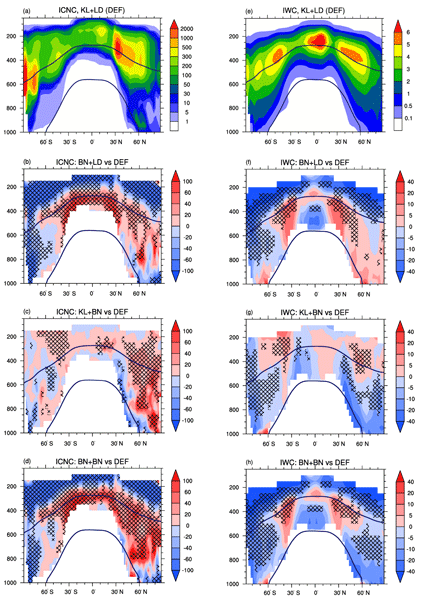 Using a chemistry--climate model future changes in the stratosphere-to-troposphere ozone mass flux, their drivers, and the future distribution of stratospheric ozone in the troposphere are investigated. In an extreme greenhouse gas (GHG) scenario, the global influx of stratospheric ozone into the troposphere is projected to grow between 2000 and 2100 by 53%. The increase is due to the recovery of stratospheric ozone owing to declining halogens and GHG induced circulation and temperature changes. Surface-based measurements from the EMEP network and EMAC model simulations are used to estimate the European surface ozone changes over 1995–2014. It shows a significantly decreasing trend in the 95th percentile ozone concentrations, while increasing in the 5th percentile ozone. 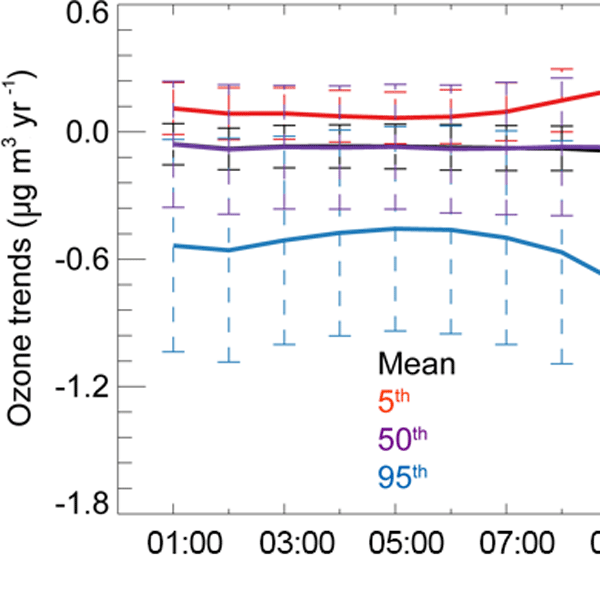 Sensitivity simulations and statistical analysis show that a decrease in European anthropogenic emissions had contrasting effects on surface ozone trends between the 95th and 5th percentile levels. We quantified the contribution of land transport and shipping emissions to tropospheric ozone using a global chemistry–climate model. Our results indicate a contribution to ground-level ozone from land transport emissions of up to 18 % in North America and Southern Europe as well as a contribution from shipping emissions of up to 30 % in the Pacific. Our estimates of the radiative ozone forcing due to land transport and shipping emissions are 92 mW m−2 and 62 mW m−2, respectively. Ozone depletion events (ODEs) in the polar boundary layer are observed frequently in spring. ODEs serve as a source of tropospheric BrO at high latitudes. 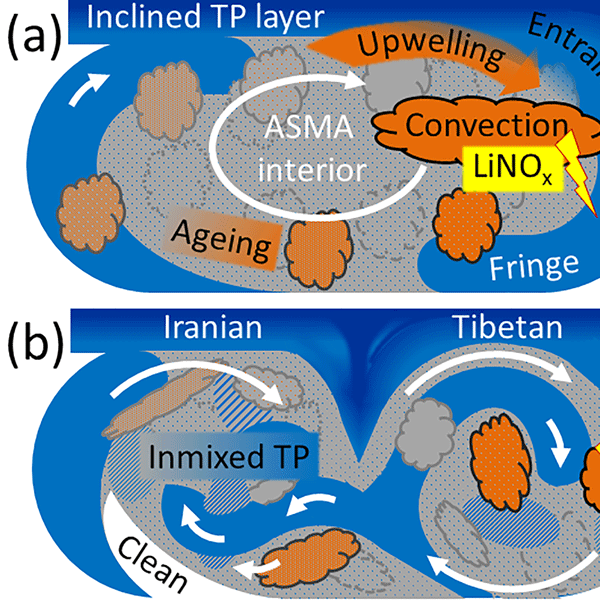 A treatment of bromine release and recycling on sea-ice- and snow-covered surfaces is implemented in global chemistry–climate model EMAC based on a scheme of Toyota et al. (2011). Many aspects of bromine enhancement and associated ODEs are reproduced in both polar regions. Further bromine release mechanisms can now be tested in a global model. As part of the model documentation of the MECO(n) system, this article documents the basics of the Multi-Model-Driver expansion (MMD v2.0) to two-way coupling and the newly developed generic MESSy submodel GRID (v1.0), which is used by MMD v2.0 for the generalised definition of arbitrary grids and for the transformation of data between them. More than 1 billion tons of mineral dust particles are raised into the atmosphere every year, which has a significant impact on climate, society and ecosystems. The location, time and amount of dust emissions depend on surface and wind conditions. In the atmospheric chemistry–climate model EMAC, we have updated the relevant surface data and equations. Our validation shows that the updates substantially improve the agreement of model results and observations. The global budget of atmospheric methane (CH4) was numerically simulated for 1997–2014. Observations from ground stations and aircraft flights indicate a period of declining methane increase during 1997–1999, followed by seven years of stagnation and a sudden resumed increase after 2006. Starting the simulation with a global methane distribution in 1997 and using CH4 sources from eleven categories together with photochemical and soil sinks, the model well reproduces the observations. We present a new method to derive equivalent effective stratospheric chlorine (EESC), which is based on an improved formulation of the propagation of trends of species with chemical loss from the troposphere to the stratosphere. EESC calculated with the new method shows much better agreement with model-derived ESC. Based on this new formulation, we expect the halogen impact on midlatitude stratospheric ozone to return to 1980 values about 10 years later, then using the current formulation. This study shows that agricultural emissions are important for air quality and their reduction can effectively reduce the concentration of fine particles and their associated premature mortality. Therefore, emission control policies, especially in North America and Europe, should also involve strong ammonia emission decreases to optimally reduce fine-particle concentration. We present an application of GPU accelerators in Earth system modeling. We developed software that generates CUDA kernels for numerical integration in the global climate model EMAC, used to study climate change and air quality. We focus on atmospheric chemical kinetics, the most computationally intensive task in climate–chemistry simulations. This approach can serve as the basis for hardware acceleration of numerous geoscientific models that rely on KPP for chemical kinetics applications. Brominated very short-lived source gases (VSLS) contribute significantly to the tropospheric and stratospheric bromine loading. We find an increase of future ocean–atmosphere flux of brominated VSLS of 8–10 % compared to present day. A decrease in the tropospheric mixing ratios of VSLS and an increase in the lower stratosphere are attributed to changes in atmospheric chemistry and transport. Bromine impact on stratospheric ozone at the end of the 21st century is reduced compared to present day. In this study we identify an often overlooked stable oxide of carbon, namely carbon suboxide (C3O2), in ambient air. We have made C3O2 and in the laboratory determined its absorption cross section data and the rate of reaction with two important atmospheric oxidants, OH and O3. By incorporating known sources and sinks in a global model we have generated a first global picture of the distribution of this species in the atmosphere. We revisit the proxies/uncertainties for the 13C/12C ratios of emissions of reactive C into the atmosphere. Our main findings are (i) a factor of 2 less uncertain estimate of tropospheric CO surface sources δ13C, (ii) a confirmed disagreement between the bottom-up and top-down 13CO-inclusive emission estimates, and (iii) a novel estimate of the δ13C signatures of a range of NMHCs/VOCs to be used in modelling studies. Results are based on the EMAC model emission set-up evaluated for 2000. We present a diagnostics, implemented in an Earth system model, which keeps track of the contribution of source categories (mainly emission sectors) to various concentrations (O3 and HOx). For the first time, it takes into account chemically competing effects, e.g., the competition between ozone precursors in the production of ozone. We show that the results are in-line with results from other tagging schemes and provide plausibility checks for OH and HO2, which have not previously been tagged. We analyzed the sensitivity of model-predicted global-scale OA to parameters and assumptions that control primary emissions, photochemical aging, and the scavenging efficiency of LVOCs, SVOCs, and IVOCs. The simulated OA concentrations were evaluated against a global dataset of AMS measurements. According to our analysis, a combination of increased IVOCs and decreased hygroscopicity of the freshly emitted IVOCs can help reduce discrepancies between simulated SOA and observed OOA concentrations. 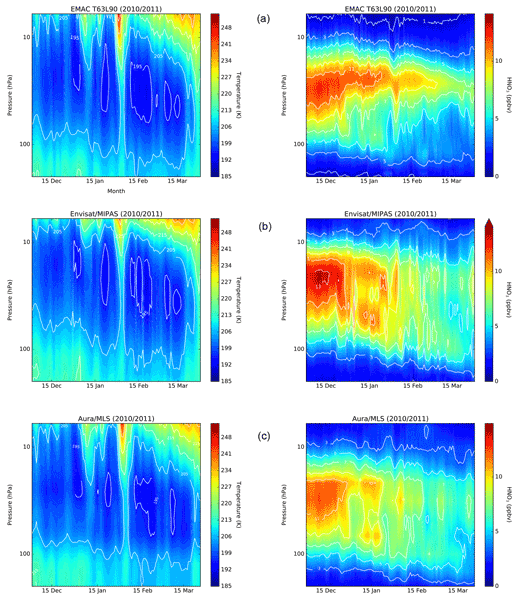 We investigate the processes, frequency of occurrence and seasonality, and effects of strongly enhanced ozone layers in the middle–upper troposphere (SOPs) over the Himalayas using a global model (EMAC). Rapid transport of stratospheric air masses is found as a key underlying process. Model predicts more frequent SOP events during the pre-monsoon. SOPs are found to significantly enhance the tropospheric ozone column over the Himalayas. 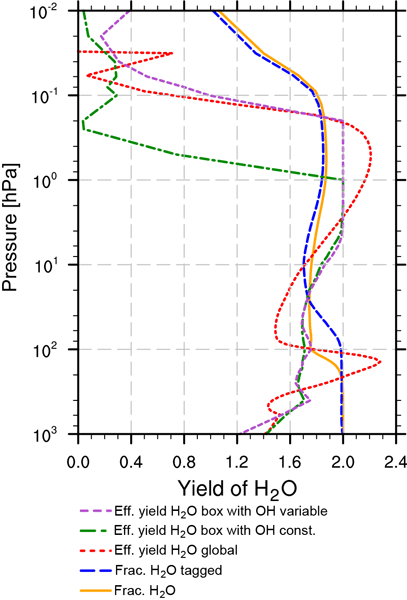 We analysed the temporal evolution of fractional release factors (FRFs) from EMAC model simulations for several halocarbons and nitrous oxide. The current formulation of FRFs yields values that depend on the tropospheric trend of the species. This is a problematic issue for the application of FRF in the calculation of steady-state quantities (e.g. ODP). Including a loss term in the calculation, we develop a new formulation of FRF and find that the time dependence can almost be compensated. 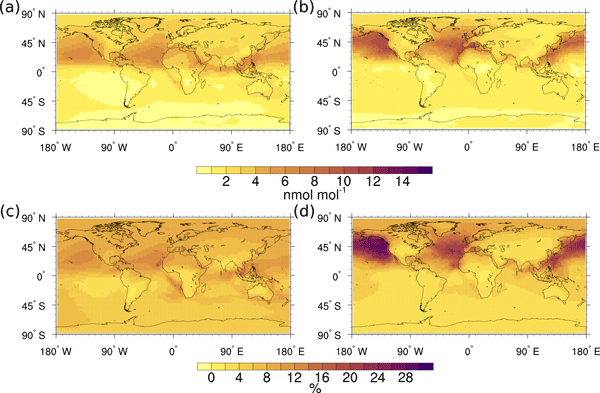 We present a modeling study on the impacts of the key processes (dust emission flux, convection and dust aging parameterizations) that control the transatlantic dust transport using an advanced version of the EMAC atmospheric chemistry general circulation model. We define the direct effect of dust aging as an increase in the AOD as a result of hygroscopic growth. We define the indirect effect as a reduction in the dust AOD due to the higher removal of the aged dust particles. The paper describes the impact of lightning and the associated NOx emissions on upper-tropospheric aerosol nitrate. The consequences for both the chemical composition of the atmosphere as well as climatic impacts, which originate from lightning and modified aerosol particles, are analysed and discussed. We investigate the influence of the North Atlantic Oscillation on atmospheric pollutant transport in the 21st century under a global climate-change scenario, using a coupled atmosphere–chemistry–ocean general circulation model. We find that, at the end of the century, the south-western Mediterranean and northern Africa will see higher pollutant concentrations during positive NAO phases with respect to the past, while a wider part of north Europe will see lower pollutant concentrations. We investigate the contribution of tropopause folds in the summertime tropospheric ozone pool over the eastern Mediterranean and the Middle East. For this purpose we use the EMAC atmospheric chemistry–climate model and a fold identification algorithm. A clear increase of ozone is found in the middle troposphere due to fold activity. 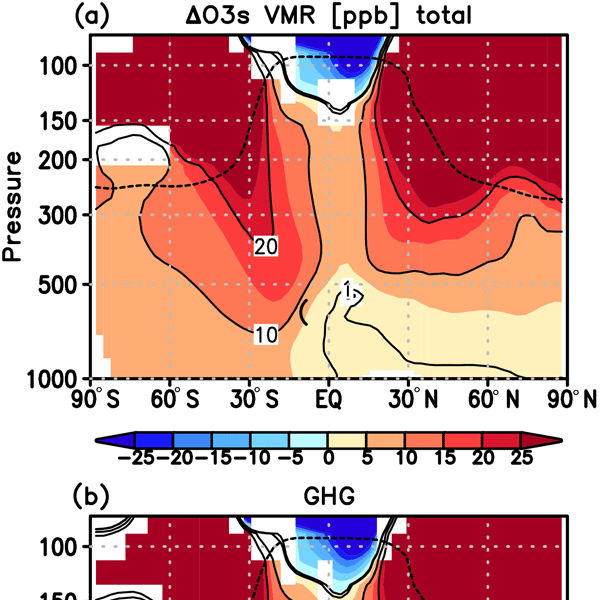 The interannual variability of near-surface ozone over the eastern Mediterranean is related to that of both tropopause folds and ozone in the free troposphere. The self-cleaning capacity of the atmosphere is controlled by hydroxyl (OH) radicals in the troposphere. There are primary and secondary OH sources, the former through the photodissociation of ozone, the latter through OH recycling. We used a global model, showing that secondary sources are larger than assumed previously, which buffers OH. 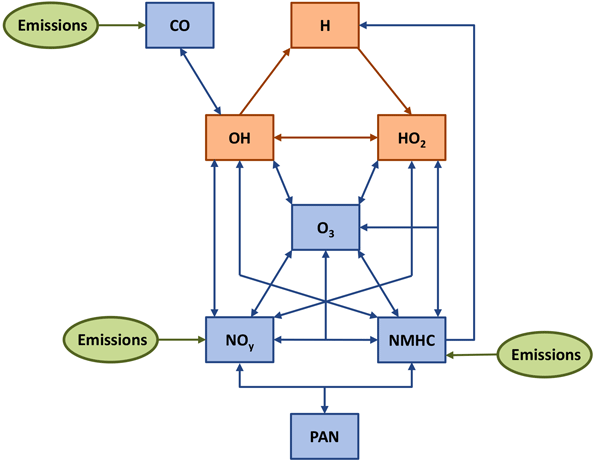 Complementary OH formation mechanisms in pristine and polluted environments, connected through transport of ozone, can maintain stable global OH levels. This fourth part in a series of publications describing the newly developed regional chemistry–climate system MECO(n) is dedicated to the evaluation of MECO(n) with respect to tropospheric gas-phase chemistry. For this, a simulation incorporating two regional instances, one over Europe with 50 km resolution and one over Germany with 12 km resolution, is conducted. The model results are compared with satellite, ground-based and aircraft in situ observations. We examine an alternative approach to heterogeneous cluster-computing for Earth system models, using the EMAC model as a pilot application on the Dynamical Exascale Entry Platform (DEEP). A set of autonomous interconnected coprocessors complements a conventional HPC cluster to increase computing performance and offer extra flexibility to expose multiple levels of parallelism and achieve better scalability, towards exploiting the potential of a fully Exascale-capable platform. This study introduces AirTraf v1.0 for climate impact evaluations, which performs global air traffic simulations in the ECHAM5/MESSy Atmospheric Chemistry model. AirTraf simulations were demonstrated with great circle and flight time routing options for a specific winter day, assuming an Airbus A330 aircraft. The results confirmed that AirTraf simulates the air traffic properly for the two options. Calculated flight time, fuel consumption and NOx emission index are comparable to reference data. 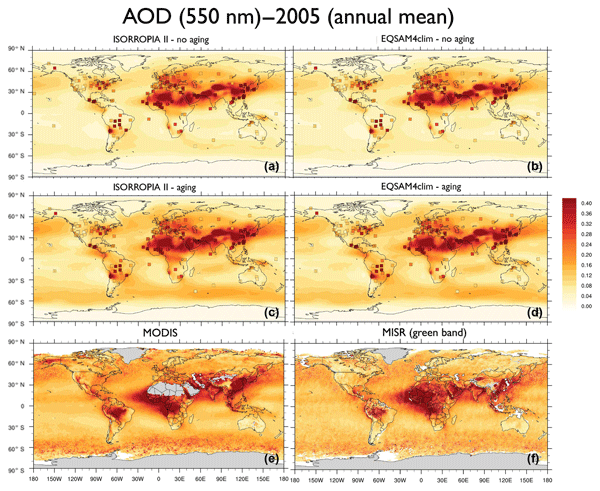 In this work we use a global chemistry climate model together with a comprehensive global AMS data set in order to provide valuable insights into the temporal and geographical variability of the contribution of the emitted particles and the chemically processed organic material from combustion sources to total OA. This study reveals the high importance of SOA from anthropogenic sources on global OA concentrations and identifies plausible sources of discrepancy between models and measurements. 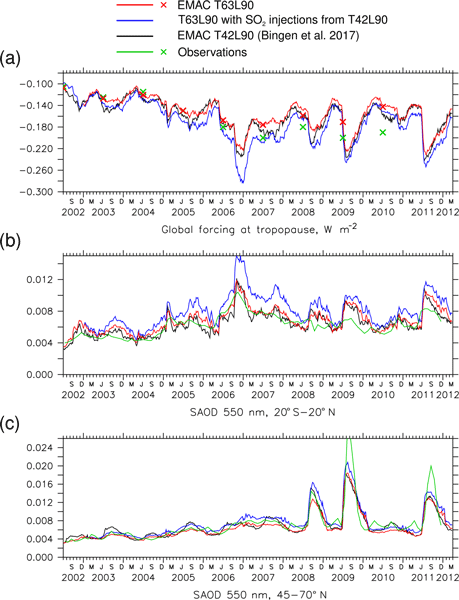 This study investigates the water vapour decline in the stratosphere beginning in the year 2000 and other similarly strong stratospheric water vapour reductions. The driving forces are tropical sea surface temperature (SST) changes due to coincidence with a preceding ENSO event and supported by the west to east change of the QBO. There are indications that both SSTs and the specific dynamical state of the atmosphere contribute to the long period of low water vapour values from 2001 to 2006. Four new radiation related submodels (RAD, AEROPT, CLOUDOPT, and ORBIT) are available within the MESSy framework now. 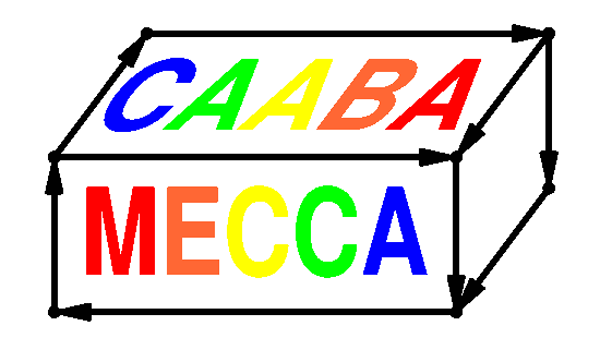 They are largely based on the original radiation scheme of ECHAM5. RAD simulates radiative transfer, AEROPT calculates aerosol optical properties, CLOUDOPT calculates cloud optical properties, and ORBIT is responsible for Earth orbit calculations. Multiple diagnostic calls of the radiation routine are possible, so radiative forcing can be calculated during the model simulation. 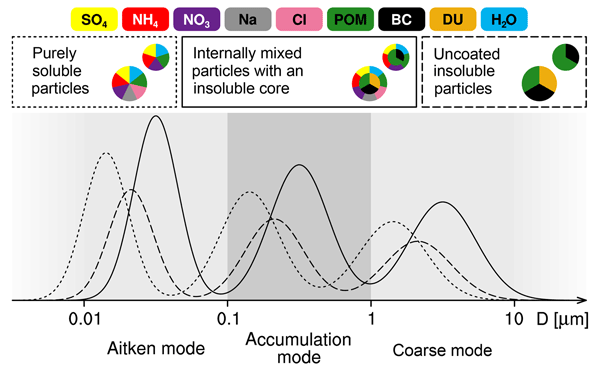 We introduce an unique single parameter framework to efficiently parameterize the aerosol water uptake for mixtures of semi-volatile and non-volatile compounds, being entirely based on the single solute specific coefficient introduced in Metzger et al. (2012). The global atmospheric budget and distribution of monocyclic aromatic compounds is estimated, using an atmospheric chemistry general circulation model. Simulation results are evaluated with observations with the goal of understanding emission, production and removal of these compounds. Anthropogenic and biomass burning are the main sources of aromatic compounds to the atmosphere. The main sink is photochemical decomposition and in lesser importance dry deposition. After the two major volcanic eruptions of El Chichón in Mexico in 1982 and Mount Pinatubo on the Philippines in 1991, stratospheric water vapour is significantly increased. This results from increased stratospheric heating rates due to volcanic aerosol and the subsequent changes in stratospheric and tropopause temperatures in the tropics. The tropical vertical advection and the South Asian summer monsoon are identified as important sources for the additional water vapour in the stratosphere. 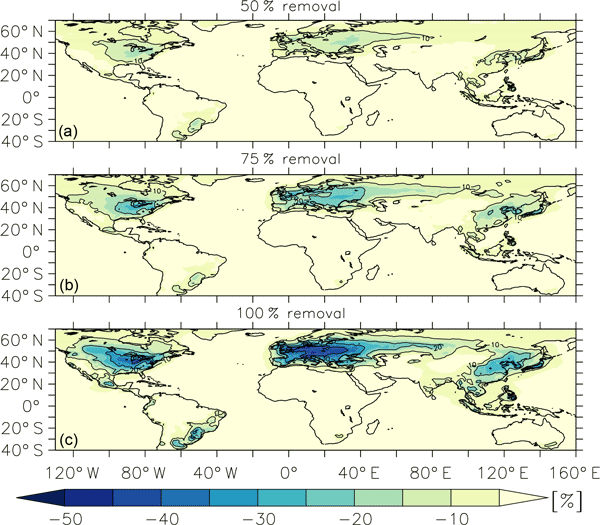 Using a global aerosol model, we estimate the impact of aviation emissions on aerosol and climate in 2030 for different scenarios. The aviation impacts on particle number are found to be much more important than the impact on aerosol mass and significantly contribute to the overall increase in particle number concentration between 2000 and 2030. This leads to a large aviation-induced climate effect (mostly driven by aerosol-cloud interactions), a factor of 2 to 4 larger than in the year 2000. With an advanced numerical global chemistry climate model (CCM) we performed several detailed combined hind-cast and projection simulations of the period 1950 to 2100 to assess the past, present, and potential future dynamical and chemical state of the Earth atmosphere. The manuscript documents the model and the various applied model set-ups and provides a first evaluation of the simulation results from a global perspective as a quality check of the data. We provide an assessment of the chemical composition and global aerosol load of aerosol nitrate and determine the effect of mineral dust on its formation due to thermodynamical interactions. For this purpose we used an explicit geographical representation of the emitted soil particle size distribution and chemical composition. We conclude mineral dust aerosol chemistry is important for nitrate aerosol formation and significantly affects its global distribution, especially in the coarse mode. The Community Earth System Model (CESM1) is connected to the the Modular Earth Submodel System (MESSy) as a new base model. This allows MESSy users the option to utilize either the state-of-the art spectral element atmosphere dynamical core or the finite volume core of CESM1. Additionally, this makes several other component models available to MESSy users. Does acetone react with HO2 in the upper-troposphere?